It’s been a while since I did a review. A long while, in fact, so to start this particular horse off again, here are some short reviews of some short ebooks. This is aimed at a younger age than the author’s previous books (I’d say 7+ – reasonably confident readers). 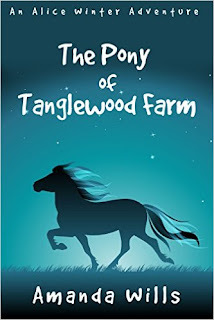 It’s a lovely read: tightly plotted, with good strong characters and authentic pony action. Heroine Alice had an accident when she was little, and ended up with a large scar on her face. It is, she thinks, the first and only thing anyone sees when they look at her, and she’s spent her life since (she’s nine) pushing people away. Alice spends most of her time at next door Tanglewood Farm, a rescue centre for animals. I approach the pony book now from a similar perspective to many children today. I live in a world that is relatively horse-free. I no longer ride. I now live in the middle of a town, where the closest I get to a horse is the carved relief of a horse opposite our local Marks and Spencers.